Rory McIlroy has acknowledged that losing his first Ryder Cup was disappointing but said it will help to keep the competition alive. Europe had won the last three, but the Americans triumphed at Hazeltine on Sunday despite the Holywood golfer’s best efforts. McIlroy lost a singles match for the first time against Patrick Reed and said he had run out of energy after his superb form in the foursomes. "Yeah, it does hurt. It's disappointing for us as a team and for me personally, taking on the role to go out and put a blue point on the board, I didn't do my job," he said. "We would definitely like to be feeling what the Americans are feeling right now. "But saying that, they haven't felt this for a while. It's been eight years since they felt this feeling. "They deserve it. They deserve their moment. We'll come back better and stronger in Paris." He added: "It's disappointing, obviously, but I think it's good for golf. "I think it keeps the Ryder Cup interesting going into France in a couple of years' time. "Not that we need any more incentive but we're going to want to get it back on our home turf next time." 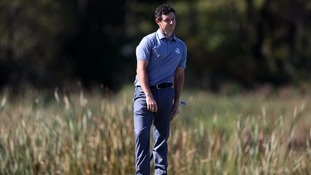 The rivalry between McIlroy and Reed during their singles match drew most of the attention on Sunday, with the Team Europe man letting his passion show on the eighth after a birdie. However, he said that although the two players had played to the crowd, there was no animosity. "I've always got on pretty well with Patrick and I know what he gets up to and he's seen what I've done this week and it's all fun and games," added McIlroy. "It's nothing personal out there. It's just a matter of trying to get one-up on each other. "I was doing my best the first few holes and as I said, just ran out of steam at the end." The loss for Europe means they will be doubly determined to regain the Cup in France in two years’ time.